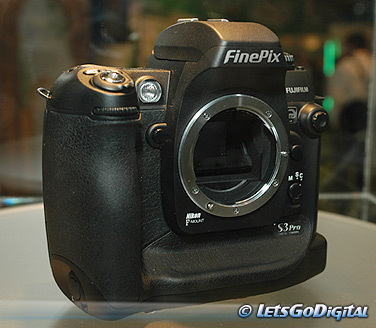 Silently behind glass and looked over by many visitors is the Fujifilm FinePix S3 PRO camera standing that has been introduced some weeks ago. The new DSLR has a respected 12.3 million effective pixels or 6.17 million S-pixels with an added value of 6.17 million R-pixels if you like. 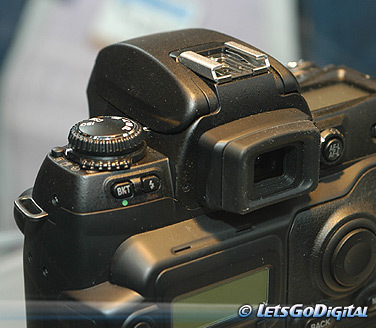 The new digital SLR camera will offer a resolution of 4256x2848 pixels and has a Super CCD SR sensor measuring 23x15.5mm. 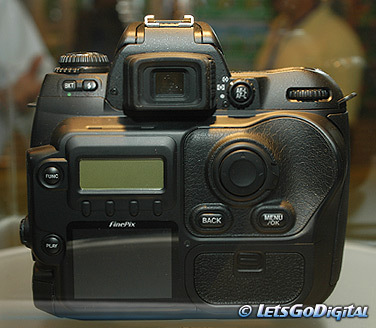 The file format will be JPEG or CCD-RAW format. The camera features a dual slot; one supports xD Picture Card and the other supports CompactFlash type II (Microdrive). The new S3 Pro features the standard Nikon F-mount so the whole range of Nikkor F-series lenses (including AF-D, AF-G and AF-S type lenses) can be used. On the back of the camera we find the dual LCD monitors we also found on the S2 Pro camera. The 2-inch 235,000 pixel LCD monitor has approx. 100% coverage of frame, as does the optical viewfinder. Above this LCD monitor we find a small display that indicates shooting information and settings. 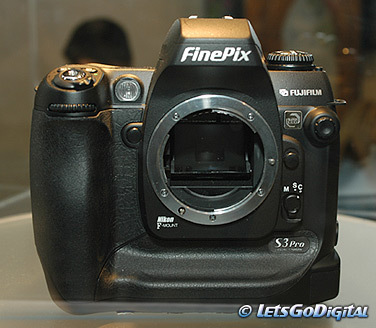 The FinePix S3 Pro offers both high-speed IEEE1394 (for camera control and data transfer) and USB 2.0 (for data transfer). The video output supports NTSC and PAL. The DLSR camera is powered by AA-size NIMH rechargeable batteries. Some other specifications are: 1.5x focal length multiplier, exposure modes P, S, A and M, shutter speed of 30sec. to 1/4000 sec and Bulb, selectable ISO setting of 100, 160, 200, 400, 800 and 1600, approx. weight of 835g (excl. batteries and lens).